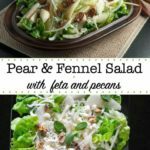 This healthy Pear and Fennel salad is a beautiful marriage of slightly sweet pears and aromatic fennel. It’s quick to make and complements any meal year-round. This Pear and Fennel Salad showcases the delicate flavour and crisp texture of one of my favourite fruits. Pears! Combined with anise-flavoured fennel, salty feta or blue cheese and nuts like walnuts or pecans, this salad is one you’ll make again and again. Pears are humble. They don’t shout out at you with bright colours like apples do. They’re not exotic or bizarre like dragonfruit. They don’t have an intense flavour like a grapefruit. They’re just pears. They’re humble, they’re subtle, and consequently they marry well with a host of other foods. Pears and fennel become BFF’s in this salad, and when they hang out with the feta and walnuts, it’s a guaranteed good time. I added thinly sliced pears and shaved fennel to a bed of delicate butter lettuce, but you could use any greens. Arugula, romaine, baby spinach, or baby kale would likely be good too. Look for pears at your farmer’s market. One of my favourite varieties is the Forelle pear. So sweet and crunchy! They’re a smaller pear, just a little larger than a Seckel, but they make up for their size with intense sweetness. They’re also downright pretty, with a freckled blush. Don’t pass them up if you find them. Did you know? I learned that the skin of pears contains at least three to four times as many phytonutrients as the flesh. These phytonutrients include antioxidant, anti-inflammatory flavonoids, and potentially anti-cancer nutrients. The skin also contains about half of the pear’s total fiber. 2 ripe pears: any firm pear will do. Anjou, Seckel, Bosc or Forelle are all firm varieties. 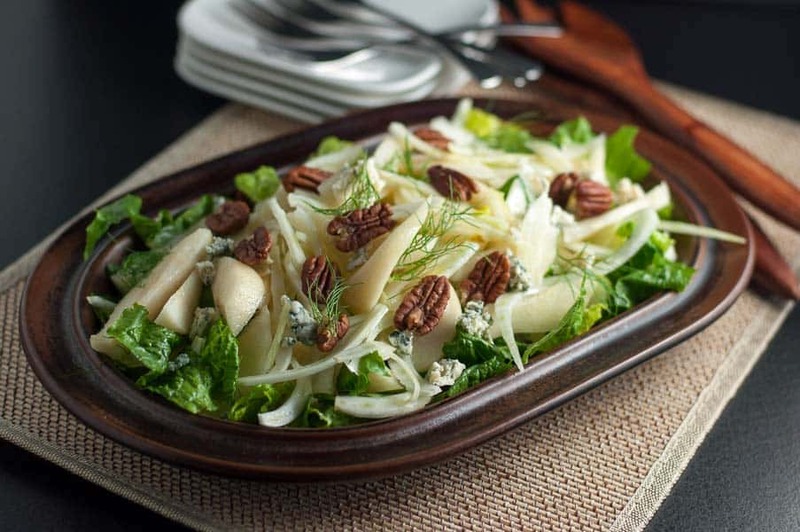 This Pear and Fennel Salad with cheese and nuts is simple to make. Begin by slicing the fennel bulb very thinly. To tenderize it, toss it with a small amount of olive oil, lemon juice and salt and set aside while you slice the pears. Combine the dressing ingredients in a small jar. 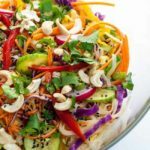 You’ll likely have more than you need for this salad. Toast the walnuts either by placing them on a baking tray and heating them in a 400°F. oven, or in a skillet on the stove top over medium heat. Watch very carefully, as they will burn quickly. Once they become fragrant and lightly browned, remove them from the heat and set aside to cool. Toss the baby greens, fennel slices, pear slices and most of the cheese and toasted walnuts with a few tablespoons of the dressing. Arrange on a platter or in a salad bowl. Top with remaining feta cheese, walnuts and garnish with mint leaves and/or fennel fronds. Serve immediately. 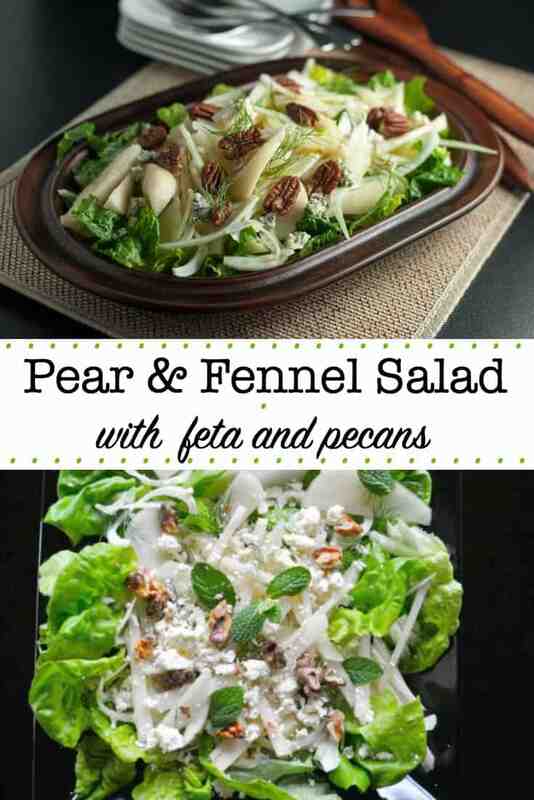 Crispy pears and fennel top a bed of baby greens with feta cheese crumbles and toasted pecans or walnuts. 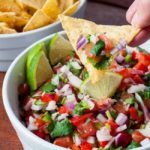 A simple salad that everyone loves! 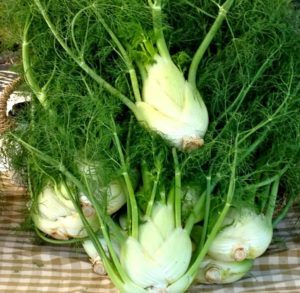 Thinly slice fennel into a small bowl, using a sharp knife or a mandolin. To tenderize it a little, drizzle with a tiny bit of olive oil, the lemon juice, and sprinkle with some salt. Toss and set aside. Whisk together the dressing ingredients. Taste and adjust the seasoning. 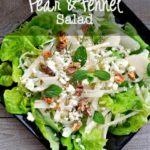 In a larger bowl, toss together the pears, baby salad greens, fennel, and most of the cheese and walnuts with the dressing. Assemble on a platter and top with the remaining cheese and walnuts. 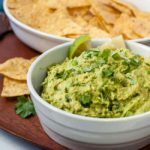 You'll probably have more dressing that what you will need. Save it for another salad. It's delicious. The flavors in this salad are amazing. Nice to have something a little different. I used pecans and blue cheese. Yum.